One mile above sea level. Far beyond ordinary. 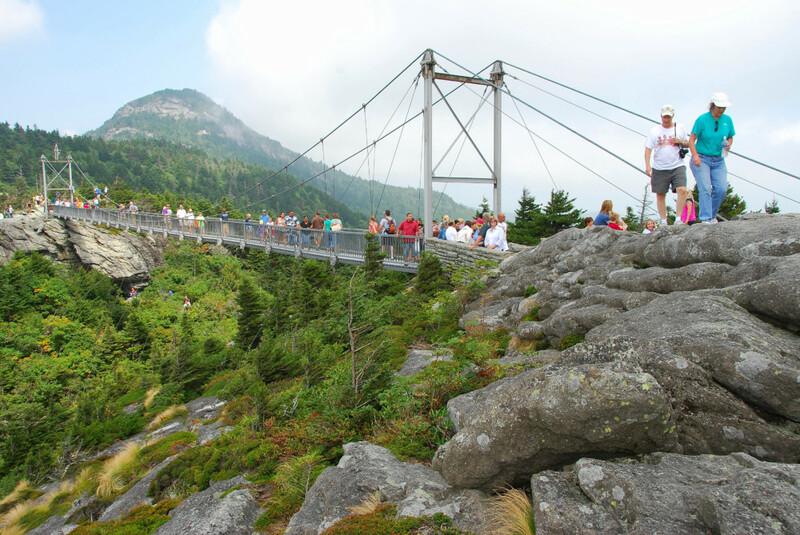 A true landmark of a pioneering spirit, the Mile High Swinging Bridge welcomes all visitors to admire 360-degree panoramic views from Grandfather Mountain. The bridge has been in place since 1952 — and for just as long it’s excited the thousands who’ve walked across with the thrills of mile-high elevation. Whether you cross it to challenge yourself, for the scenery, or to admire this engineering masterpiece, the experience will make your trip to Grandfather complete. The Mile High Swinging Bridge, America’s highest suspension footbridge, was built to give visitors easy access to the breathtaking view from Grandfather Mountain’s Linville Peak. The 228-foot suspension bridge spans an 80-foot chasm at more than one mile in elevation. Surveys show that the journey to the other side is always considered the highlight of a trip to Grandfather Mountain. The new Top Shop provides elevator access to the Mile High Swinging Bridge, making the span accessible to people with disabilities for the first time. It is about 50 yards from the building to the bridge, and a bench is located near the bridge. Former North Carolina Tourism Director Charles J. Parker coined the name ” Mile High Swinging Bridge” at the Bridge’s dedication in 1952. The term “mile high” refers to the structure’s elevation above sea level (5,280 feet). The term “swinging” refers to the fact that suspension bridges are free to sway. — Designed by – Charles Hartman Jr. of Greensboro, N.C. The bridge was rebuilt using the original towers. The cables, floor boards and side rails were all replaced using galvanized steel. One of the main advantages of the modern building materials is that they do not have to be painted. Now Grandfather Mountain employees will not have to hang out over the gorge to paint the span. — Redesigned by – Sutton, Kennerly & Associates Engineering of Asheville, N.C.
— Rebuilt by – Taylor & Murphy Construction Company of Asheville, N.C.